Popups are the most annoying form of advertising. Instead of getting the information you're looking for, the website shoves a popup advertisement in your face. Google should de-list any website that uses advertising Pop-ups. By default, Google's Chrome browser blocks pop-ups, but if you're seeing popups when using Chrome, you might want to check the setting. 1. At the top right corner of the Chrome browser window, click the Customize and control Google Chrome button (the icon with three vertical dots). 2. In the menu appears select Settings. 3. On the Settings page, scroll down to the bottom and click Advanced. 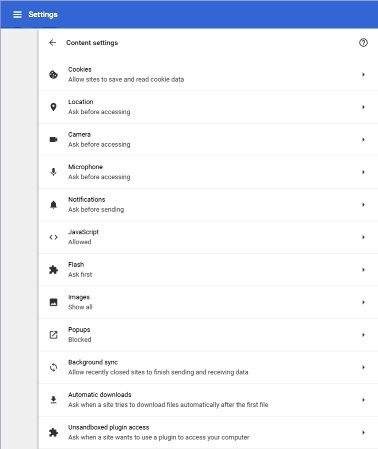 The Settings page expands, adding a Privacy and security section. 4. Under "Privacy and security", click Content settings. 5. On the Settings page, scroll down to Popups. It should say "Blocked" if not click on Popups. 7. On the page that appears, set the Blocked switch to Blocked (slider to the left). Unfortunately, even with Chrome configured to block popups, you'll still see some popups. That's because there are many different programming methods to generate a popup, and some of them can't be blocked without damaging the browser's ability to render the webpage.